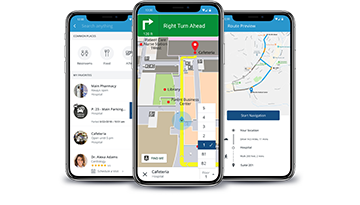 Comprised of innovators in healthcare, mobile technology, engineering, and computing, Gozio’s leadership team offers exceptional technical expertise combined with a user-centered design to deliver a superior indoor positioning platform. By keeping their focus on the customer, Gozio creates effective solutions to people’s real world problems. Joshua is passionate about creating mobile technology that informs and delights users. This passion led him to co-found Gozio after spending 12 years in management and technical leadership positions at visual computing company NVIDIA. Dennis is passionate about building businesses and using technology to create beautiful user experiences. Barb has over 30 years of healthcare industry and leadership experience ranging from start-ups to Fortune 500 companies. She is driven by her passion in healthcare not only providing exceptional clinical care, but also in delivering the best possible patient experience. Marc has over 20 years of experience in information technology with an emphasis on enterprise-wide software and IoT solutions in the Americas and EMEA. Director of Site Modeling at Gozio Health. Loves wayfinding, mobile health, and improving patient experience via navigation. Pat has thirty years of Healthcare leadership experience ranging from large Fortune 500’s to start-ups focused on solutions for hospitals and healthplans. Pete has an extensive background in developing and implementing innovative healthcare programs and services within both small and large organizations. With over 20 years of experience, Lee excels at helping rapid growth companies scale through building relationships, advancing the state-of-the-art, engaging new markets, and building strong, effective teams.